Photo by Ron Nunnari Waynesville junior Tanner Fannin slides in safe on a steal at second as Nick Newman leaps to take the throw. 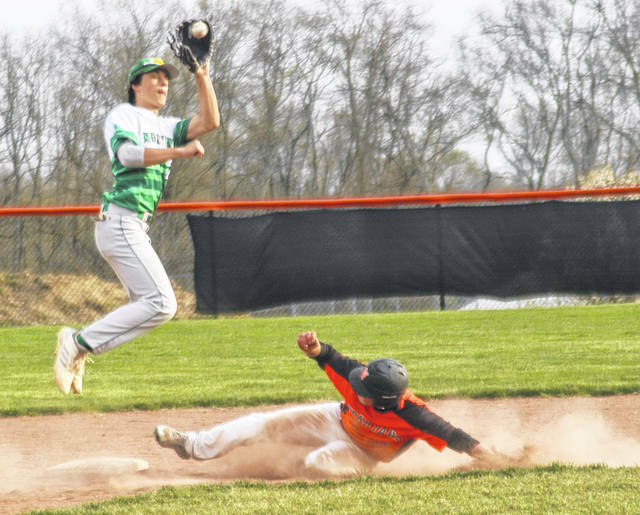 WAYNESVILLE – Northmont hitters looked at too many called third strikes Thursday night and wound up on the losing end of a 7-4 score at Waynesville. A somewhat high and inconsistent strike zone contributed to Northmont’s woes but as the saying goes, if it’s close you have to take a cut at the ball. To read the rest of the story, pick up a copy of the April 17 edition of the Brookville Star. https://www.englewoodindependent.com/wp-content/uploads/sites/26/2019/04/web1_TannerFannin-1.jpgPhoto by Ron Nunnari Waynesville junior Tanner Fannin slides in safe on a steal at second as Nick Newman leaps to take the throw.